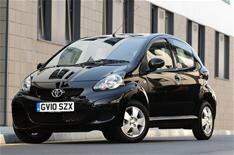 Whatcar.com Q&A follow up Toyota Aygo | What Car? Sometimes we don't get the chance to get the full answer to all of the questions in our live Tuesday lunchtime Q&A session. We aim to provide all of the information within the hour, but today we couldn't finish off a question which Victor had asked. We told Victor that water ingress was still an issue for owners in the 2010 JD Power satisfaction survey, which covers cars between one and three years old and in which the Aygo come top of its class, but also wanted Toyota to have its say. 'Following a number of concerns raised by customers about water ingress on some older Aygo models, Toyota implemented changes which are now part of an improved production standard. All new models sold today are produced to this new standard. 'If a customer experiences water ingress with an older Aygo model, they should contact a Toyota Centre who can address the issue and adjust the vehicle to this new production standard. 'We are also aware of a number of customers raising concerns about premature clutch wear. Toyota has made improvements to the production of the clutch to address this issue. All new models sold today are produced to this new standard. 'The clutch production improvement can be implemented to older vehicles. 'Once again, concerned customers are advised to contact a Toyota Centre who can implement the revised production measures. Visit Whatcar.com Live Q&A Replay to see the full session.